Recombinant monoclonal antibody to GCN4. Manufactured using AbAb’s Recombinant Platform with variable regions (i.e. specificity) from the scFv C11L34. Specificity: This antibody binds to the HLENEVARLKK peptide from the leucine-zipper domain of the S. cerevisiae GCN4 transcriptional activator with picomolar affinity. Application Notes: This antibody binds to the GCN4-leucine zipper peptide, which is part of the dimerisation- and DNA-binding domain of the transcriptional activator GCN4 in S. cerevisiae. Note on publication: Describes the generation of an scFv with high affinity using directed evolution. 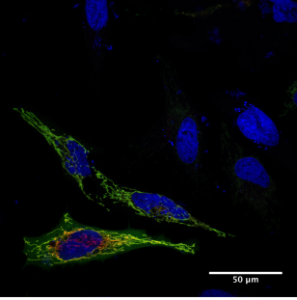 IF staining of HeLa cells expressing mCherry tagged GCN4 with Ab00436-1.1. Immunofluorescence staining of fixed HeLa cells expressing mCherry tagged GCN4 with anti-GCN4 antibody C11L34 (Ab00436) Immunofluorescence analysis of fixed HeLa cells stained with the chimeric rabbit IgG version of C11L34 (Ab00436-23.0) followed by an Alexa Fluor® 488 secondary antibody, showing mitochondrial staining. Colocalisation with mCherry tagged GCN4 demonstrates the very low off target/non-specific binding of this antibody. The nuclear and mitochondiral DNA stain is hoechst (blue). Panels show; a) mCherry tagged, mitochondrially targetted GCN4, b) Ab00436-23.0 with Alexa Fluor® 488 secondary antibody, c) DNA stained with hoechst, d) Merged channels. Images courtesy of Luming Chen (Kim Orth lab, UT Southwestern Medical Center). Immunofluorescence staining of fixed HeLa cells expressing mCherry tagged GCN4 with anti-GCN4 antibody C11L34 (Ab00436) Immunofluorescence analysis of fixed HeLa cells stained with the chimeric mouse IgG1 version of C11L34 (Ab00436-1.1) followed by an Alexa Fluor® 488 secondary antibody, showing mitochondrial staining. 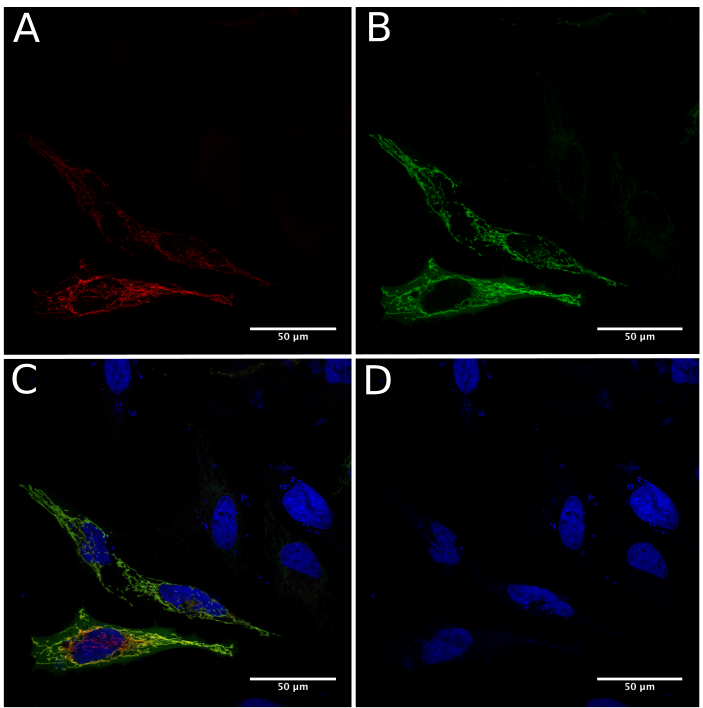 Colocalisation with mCherry tagged GCN4 demonstrates the very low off target/non-specific binding of this antibody. 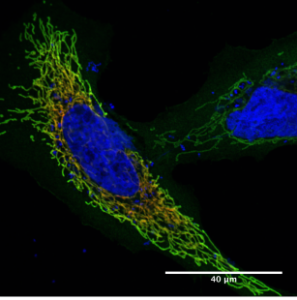 The nuclear and mitochondiral DNA stain is DAPI (blue). 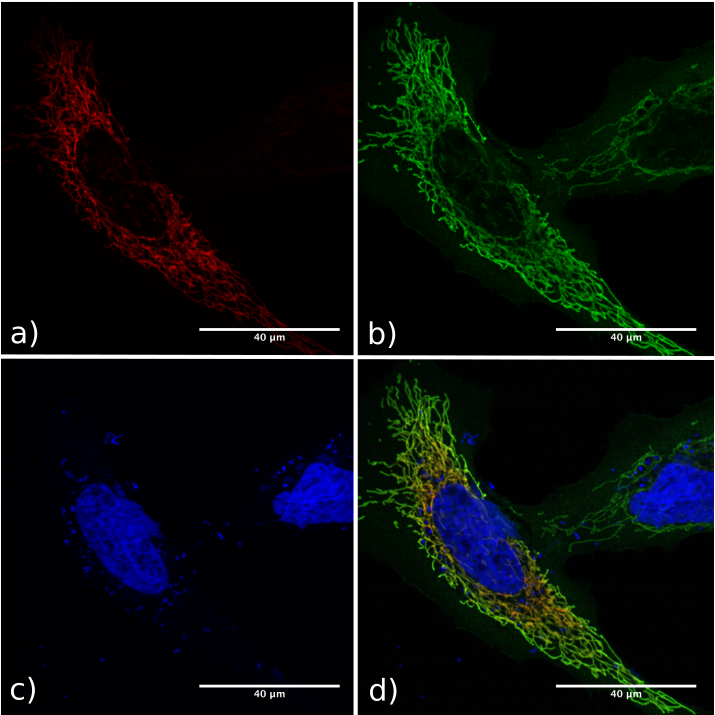 Panels show; a) mCherry tagged, mitochondrially targetted GCN4, b) Ab00436-1.1 with Alexa Fluor® 488 secondary antibody, c) DNA stained with DAPI, d) Merged channels. Images courtesy of Luming Chen (Kim Orth lab, UT Southwestern Medical Center).